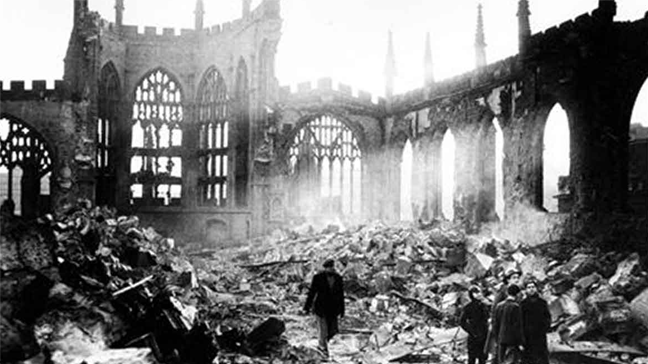 On the night of November 14th 1940, the city of Coventry–in the industrial Midlands of England–was bombed by the German air force. Among the buildings destroyed that night was the medieval Cathedral of St Michael. A new cathedral was built next to the remains of the old one. Its opening in 1962 would be the setting for one of the most powerful statements in all music about man's inhumanity to man: Britten's War Requiem. "These magnificent poems, full of the hate of destruction, are a kind of commentary on the Mass." The night Coventry was bombed, Benjamin Britten was not in England, but in the United States, where he and the tenor Peter Pears had been since June 1939. Britten made the trip for various reasons–personal and professional–but the looming threat of war in Europe was certainly a factor. When war did indeed come that September, the pair were advised to stay in America for the time being. Britten's time in the US was a happy and creative one, but by 1942 he and Pears resolved to return to England, despite the dangers of crossing the Atlantic in wartime. Britten was a committed pacifist, and knew that, once home, he would have to take a stand and refuse the military draft. Britten's pacifism dated back at least to his days at boarding school. Away from school an influential mentor–in music and much else–was the composer Frank Bridge. Arriving back in England in 1942, Britten's options were to sign up for active duty, or try to register himself as a conscientious objector. He chose the second, and set out these reasons to the tribunal that heard his case. Once recognized as a conscientious objector, Britten spent the rest of the war giving concerts with Pears. By 1958, when the committee planning the new Coventry Cathedral wanted a choral work for the opening festival, Britten was the obvious choice. A string of successful operas and other major works since the war had made him the leading British composer of the day. Earlier that year, Britten had written the song-cycle Nocturne, and included an anti-war text by Wilfred Owen, whose eyewitness poems from the trenches of the First World War were clearly still in the composer's mind when the letter arrived from Coventry. This lament for a fallen comrade foretold the poet's own fate. Wilfred Owen was killed in France one week before the fighting stopped. His family learned the news exactly one hour after peace was declared. The futility of his death only adds power to some of the finest poetry ever written about 'war and the pity of war'. The War Requiem was composed at The Red House in Aldeburgh, the Suffolk town where Britten and Pears made their home. Britten started work on the composition sketch in April 1961, and completed the full score on holiday in Greece the following January. The War Requiem does not just look back to past conflicts. In the 50s and 60s the possibility of nuclear war against the Soviet Union seemed very real to many, including Britten. He was a member of CND, the Campaign for Nuclear Disarmament, and in 1960 donated money towards one of their largest demonstrations. This was no abstract concern: there were nuclear weapons at a US Air Force base less than five miles from Aldeburgh. As he sat working on the Requiem Britten would have often heard fighter-bombers from the base roaring overhead, practising for war.